The Perfect Man for the Holidays! ‘Tis the season for cookie exchanges, family gatherings, and gift-giving! There is one man you can count on to be there for you during all of these festivities…the GINGERBREAD MAN! He is there for you when you need him most, bringing comfort and smiles to all who encounter him! So just how do you get the perfect gingerbread man for the holidays? Well, I have just the recipe for you and it comes from my friend Amy! 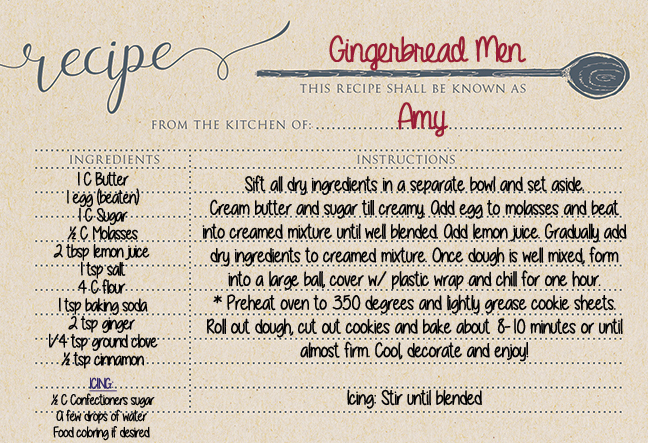 Amy provided me with an easy to follow recipe for the gingerbread! The only issue I had was that I don’t own a rolling pin! So in a pinch, I used one of my husband’s travel mugs! It worked perfectly. As long as we never misplace this mug, I won’t ever need to buy a rolling pin! Shout-out to my co-workers who really came through for me on this recipe. I was having a hard time finding molasses, and one of them brought in theirs so I didn’t have to go gallivanting around town! Another co-worker brought me her set of metal cookie cutters! You guys are the real MVPs! Look how many cookies I got out of this recipe!! A little army of gingerbread! It definitely helped that I had various sizes of cookie cutters. I was able to ball up and roll out the dough multiple times to get more and more cookies! As I said, the gingerbread recipe was great. I didn’t mess anything up! The icing recipe was another story. I just couldn’t manage to get the right ratio of powdered sugar, food coloring, and water. It was either too thick or too runny. I will stick with store bought in the future! Isabella wasn’t into decorating this time around. She mostly just wanted to watch me. Which is fine, I am just so grateful that I was able to get these cookies made! She is walking now so that has been great because I can get things done! Gone (for now) are the days of her crying to be held or her hugging on my legs while I try to cook! She would occasionally come into the kitchen to check on me and play with Tupperware, which was fine with me! Here is an example of it being a bit too runny, and I felt like I just kept adding more sugar to no avail. Needless to say, I gave up because I just felt like I was wasting the sugar. But I improvised again and made a Jackson Pollock design! I thought I was pretty creative with giving them “pants.” I’m ignoring the fact that I was actually trying to make purple frosting. Again, my ratios, ugh! So, needless to say, the majority of the cookies stayed unfrosted. Do you have a recipe for frosting? Share in the comments! These were a hit! I think my co-workers were impressed by my skills! So thank you Amy!! Isabella liked them too. She tried an unfrosted piece and kept reaching for more. My Isabella, and Amy’s granddaughter, Ellie, have something in common now…a love for fresh baked cookies! I will definitely make these next Christmas, and quite possibly for my family’s festivities this year. I just have to remember that Christmas is literally around the corner. What is your favorite goodie to bake during the holidays? Your Gingerbread Man was delicious, Lydia! Thanks for sharing with us! Joyce, you are so sweet! Glad you liked it!! Thanks for the fun Lydia. Thinking I will have to try this with my granddaughters! Thank you AJ! You definitely will have to get them involved! Let me know how it goes!